Multiplex IHC allows the simultaneous detection of multiple proteins of interest in a single tissue sample. Increasing availability of multiple biomarkers for molecular diagnosis and limited availability of rare patient biopsy material has led to the development of multiplexed assays. Novel multiplex IHC methods that have been developed at Propath allow the identification of four to five discrete antigens in a single section, visualised by brightfield or fluorescent microscopy. Multiplex IHC is particularly attractive in the field of immuno-oncology as it enables detection of spatial relationships and an understanding tumour microenvironment. Multiplex IHC followed by quantitative image analysis addresses the issue of tumour heterogeneity leading to better therapeutic regimens. Custom developed image analysis algorithms developed by Propath and its partners enables quantification of immune cell numbers, immune cell co-localisation and spatial relationships within the tumour microenvironment. Quantification of such parameters is particularly beneficial in understanding the mechanism of action of immunotherapies. Read more about how Propath successfully developed dual multiplex stains for a GCP study of immune cell markers here. Multiplex assays at Propath are not limited only to IHC biomarkers. The team at Propath has experience of developing IHC/ISH multiplex and IHC/Special Stain multiplex assays. These multiplex assays have proven to be valuable in establishing maximum study data from minimal tissue samples and have also been used in the development of companion diagnostic tests. GFAP and Iba-1 Immunofluorescence multiplex in brain using FITC and Rhodamine detection. Astrocytes are stained green, the microglia are stained red and cell nuclei are stained blue using DAPI. Multiplex staining of immune cell markers and Ki67 in tonsil. CD68 is shown in teal (Coumarin), CD4 in red (Texas red), CD20 in green (FAM), FoxP3 in purple (Cy5) and Ki67 in yellow (Rhodamine). IHC/Special stain multiplex. Combining Podocin IHC stain and Masson’s Trichrome special stain, in renal tissue. 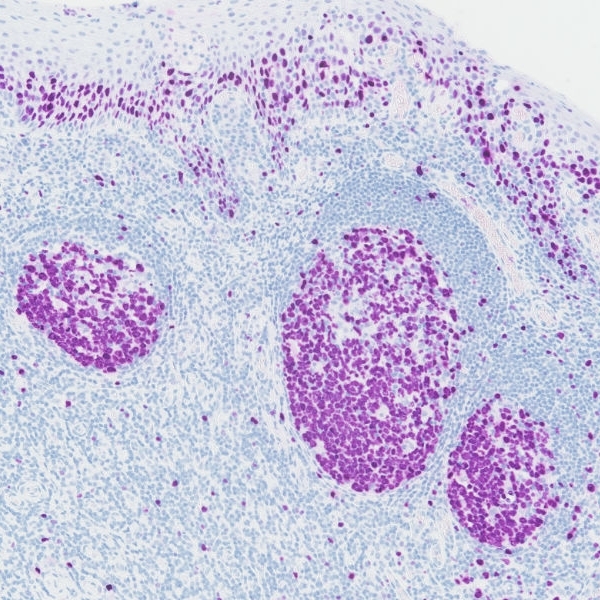 Multiplex IHC triple stain of proliferative and immune cell sub-populations; Ki67 (DAB/brown), CD4 (purple), CD68 (yellow) staining in human tonsil tissue. Demonstrating optimal tissue morphology and antigenicity – tissue integrity dual multiplex IHC with Cytokeratin 19 (DAB/brown) and Vimentin (pink). Multiplex IHC dual stain of proliferative and T cell sub-populations; Ki67 (teal), CD4 (yellow) staining in human tonsil tissue. Images: Access to the latest chromogenic detection kits. Displaying some of the newly available chromogenic detection kits with Ki67 IHC in human tonsil tissue. Access to different chromogenic detection systems allows multiplexing and visualisation of multiple biomarkers in the same tissue section.